Celestial Quest. 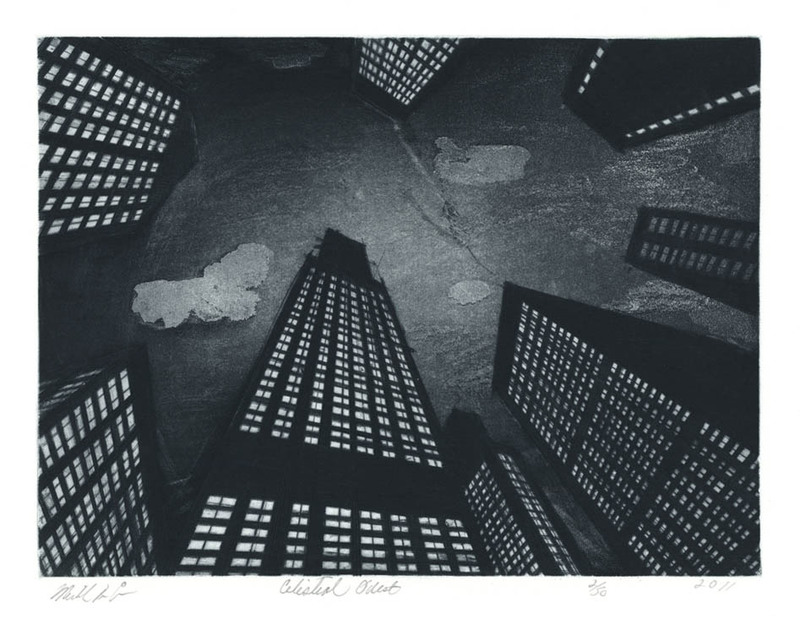 Etching, aquatint, and drypoint, 2011. Michael Di Cerbo was born in Paterson, New Jersey, in 1947. He received his BFA and MFA from Pratt Institute in New York City and is currently a member of the National Academy of Art, the Society of American Graphic Artists (SAGA), New York Artists Equity, Boston Printmakers Association and Audubon Artists, Inc. He served as the President of SAGA twice. The mystery and grandeur of New York City's environment has inspired a lifetime of work. 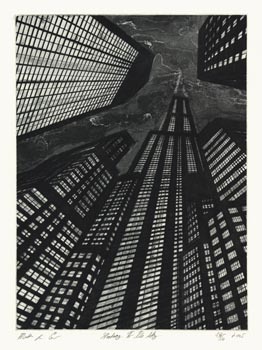 Di Cerbo uses geometric forms and patterns of light and darkness to allude to the soaring architecture of the urban skyscraper. One can see the city from the perspective of an ant or an eagle, moving endlessly upward or falling away into infinite chasms. The images, though devoid of any overt signs of life, create an ambiance of mystery. 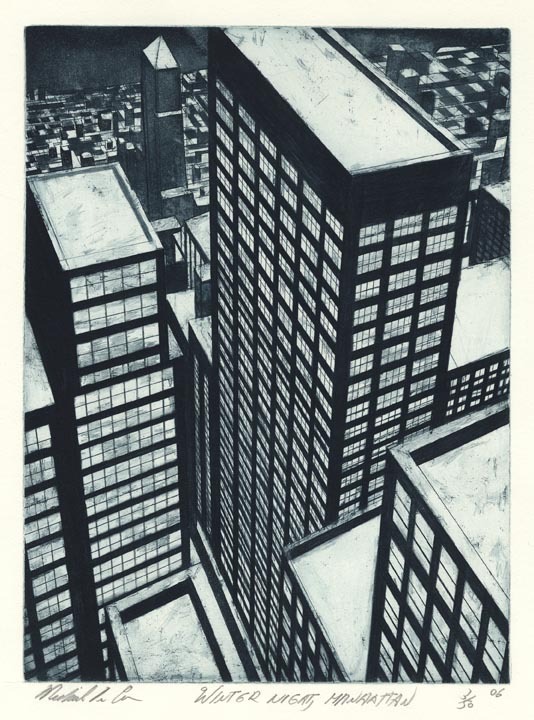 One may find themselves alone in his compositions as an observer of a timeless cityscape. These urban and architectural elements were not the only focus of his artistic career, however. Michael Di Cerbo also spent some time in an artist colony and privately touring Ireland, where he produced rich compositions that offer a very different perspective of life than his urban scenes. 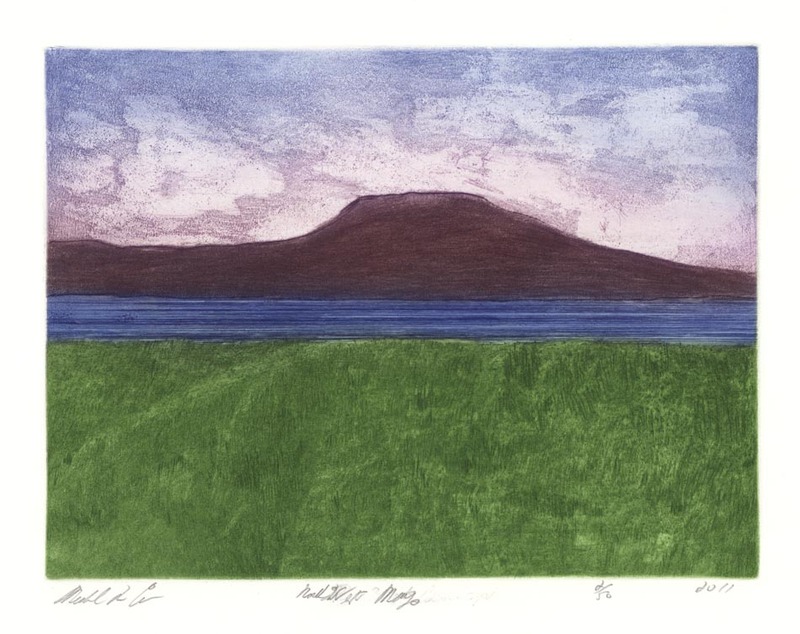 Di Cerbo's prints have been exhibited extensively in the United States and abroad. 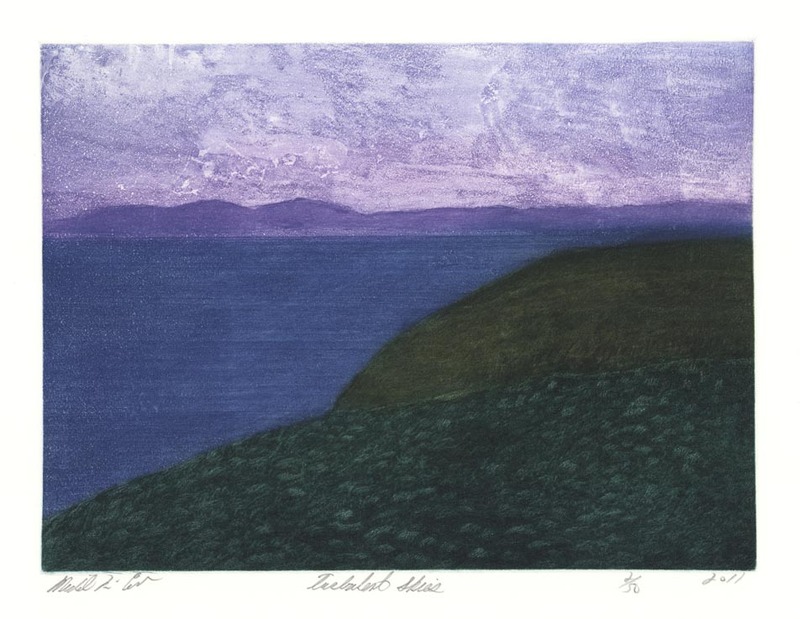 He has received numerous awards including the Residency Fellowship, Balliglen Arts Found, Ballycastle, Ireland; Salumungi Club Award; Audubon Artists 67th; Print Club of Albany, Presentation Print Commission; Beveled Edge Award; SAGA 66th Nat; Silver Medal Award, Audubon Artists 52nd Nat; Print Club of Albany, Purchase award; Profile Award, Manhattan Arts Mag, 92. His work is in the permanent collections of Museum of Modern Art, NY; British Museum, London, England; National Gallery, Washington DC; Victoria-Albert Museum, London, England; Brooklyn Museum, Brooklyn, NY; Detroit Art Institute, Detroit, MI; New York Historical Society, NY; New Orleans Museum of Art, LA; Portland Art Museum, Oregon; New York Academy of Design, NY; New York Public Library, NY; New Jersey State Museum, NJ; Hanoi National Museum of Fine Art, Hanoi, Vietnam. To view more work by Michael Di Cerbo please visit his artist page.